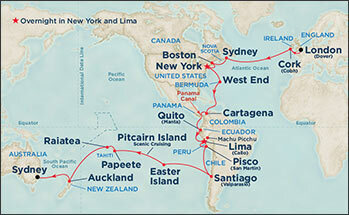 This 49 day World Cruise takes you from London to Sydney with stops in many magnificent cities around the world. The Sanctuary offers a relaxing alternative to the myriad outdoor activities and entertainment available elsewhere. Movies Under the Stars�, the 300-square foot, 69,000-watt poolside movie-theater, offers passengers the unique opportunity to enjoy blockbuster Hollywood movies against a backdrop of sea and sky. Get pampered from head to toe for an hour of bliss or the entire day. Or spend some time with a personal trainer in our world-class gyms. Princess specialty restaurants offer a memorable dining experience in an intimate and upscale atmosphere. Each restaurant offers a distinctive menu with both traditional favorites and more adventurous options prepared and served by a staff dedicated to making your evening unforgettable. A more refined approach to the traditional steakhouse serving the highest quality cuts of beef, plus a prime-rib carving station. See how Princess ships are outfitted with a variety of stateroom categories. The luxurious Premium Mini-Suite offers approximately 365 to 536 square feet of comfort and a separate seating area with a sofabed for sleeping a third passenger. The spacious rear-facing balcony is approximately 85 to 160 square feet and offers spectacular wake views. The bathroom has a combination tub and shower. The spacious approximately 179-square-foot Balcony stateroom is appointed with fine amenities and outstanding views from an approximately 28-square-foot private balcony. The Premium Oceanview stateroom is approximately 173 square feet and features a picture window for memorable views. The Premium Oceanview stateroom is richly appointed with fine amenities. The Obstructed Oceanview stateroom is approximately 135 to 155 square feet and features the same fine amenities as our Oceanview stateroom, but the view from the picture window is fully or partially obstructed. The Interior stateroom is 135 to 148 square feet and richly appointed with fine amenities. Founded in the 7th century by St. Fin Barre, Cork is your gateway to romantic Ireland. Stroll down narrow country lanes or see the Lakes of Killarney. The intrepid visitor may scale the narrow passages of Blarney Castle to kiss the Blarney Stone. The region around Cork is also home to one of the densest concentration of prehistoric monuments in Western Europe. And, in a land where fable and fact blend to become folklore, it was near Cork that the great Tuatha De Danaan, a race with magical powers, was driven underground by the conquering Celts. Note: Your ship will dock in Cobh which is about 15 miles from Cork. Hailed as the "Cradle of American Independence," Boston is filled with historic sites. Boston was America's first great city. In the 19th century, Boston was rightly described as the "Athens of America." Today this city of 800,000 retains its vitality, combining historic districts with revitalized urban centers while remaining faithful to its venerable roots. It is a city every American should visit at least once. Follow the Freedom Trail along three of the most historic miles in the country. See the site of the Boston Tea Party, trace the route of Paul Revere's famous ride, and stand on the bridge where Minutemen fired "the shot heard 'round the world." In the old Charleston Navy Yard you can see the USS Constitution, the nation's oldest commissioned warship. The Royal Naval Dockyard, the westernmost point in Bermuda, not only showcases Bermuda's nautical heritage, but it also provides a home for an impressive array of attractions and shopping opportunities. The fortifications of the Royal Naval Dockyard were built by British convicts and slave labor during the mid-1800s. Since then it has served many purposes, including the headquarters for the Royal Navy and a strategic defense post for the British in the North Atlantic. Most recently it has been redeveloped into a fascinating attraction offering visitors a glimpse into Bermuda's history, and has become a fun place to shop or explore. The centerpiece of the Dockyard is the commanding Clocktower building, which once served as a naval store and the captain's offices. Today, it has been marvelously restored. Throughout the Dockyard, you will find several restaurants, art galleries, the Bermuda Craft Market, and the Bermuda Maritime Museum, as well as an array of specialty shops and boutiques. Manta is your gateway to Ecuador and its capital, Quito. Founded in 1534, Quito is one of the best-preserved cities in South America, boasting superb 16th- and 17th-century Baroque architecture including Convents and Churches which include the first major religious structure built in the New World. In 1978, Quito and Krakow, Poland were the first World Heritage Sites to be designated by UNESCO. Ecuador possesses one of the world's most varied terrains. To the west of Manta lie the Galapagos Islands. To the east rises the great rampart of the Andes. Note: Manta offers little in the way of tourist infrastructure. Transportation and tour guides are imported to the area. Despite the sometimes hot and humid conditions there is no guarantee of air-conditioned vehicles..
San Martin is your gateway to the quiet colonial town of Pisco and its fertile coastal valley. For thousands of years, pre-Columbian societies thrived in river valleys such as this. Utilizing sophisticated systems of irrigation, they transformed the harsh coastal desert into productive farmland. The legacy of these ancient people, from their giant geometric etchings on the desert floor to their ancient burial grounds, continues to draw curious adventurers from around the world. San Martin is also your gateway to two other mysterious marvels: the Inca palace complex at Machu Picchu and the Galapagos Archipelago. A bay bordered by steep hills, stately old Victorian homes, cable cars - no, it's not San Francisco, California. Welcome to Valparaiso. Populated in 1536, and named after the birthplace of conquistador Diego de Almagro, Valparaiso is Chile's oldest city. It is also the gateway to Chile's central valley and the capital of Santiago. With a population of over 5 million people, Santiago sprawls at the feet of the snow-capped Andes. The Maipo Valley, Chile's internationally renowned wine district is a short drive to the south. The monoliths of Easter Island have fascinated and puzzled Westerners since the Dutch seaman Roggeven made landfall there on Easter Sunday, 1722. The mystery of Easter Island's first settlers remains just that - a mystery. Today, most anthropologists believe the island was settled as part of the great wave of Polynesian emigration. (The oldest of the Moai, as the great monoliths are called, date to 700 A.D.) The society that produced the Moai flourished during the 16th and 17th centuries, but population growth, deforestation and food shortages led to its collapse. Today some 3,400 souls inhabit this 64-square-mile island, which lies some 2,200 miles equidistant from Tahiti and South America. 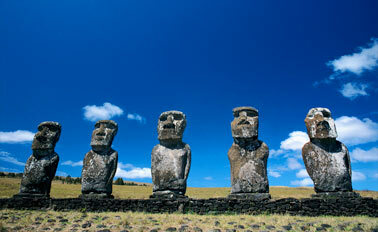 The society of Rapa Nui possessed stone-working skills on a par with those found in the Inca Empire. Islanders also possessed a script called Rongorongo, the only written language in all of Oceania. Please note: The current fee for entry into the National Park is $63 per person, this fee is included in all organized shore tours. Independent passengers are required to pay this fee on arrival at the park. Easter Island is an anchorage port. Transportation from the ship to shore will be via the ship's tender service. Lying below the tropic of Capricorn, halfway between New Zealand and the Americas, lonely Pitcairn Island is one of the most remote inhabited islands in the world. It was here that Fletcher Christian and eight of the mutineers of the HMS Bounty, along with their Tahitian companions, came in search of a new life. Set aflame and sunk by the infamous mutineers, parts of the legendary HMS Bounty shipwreck are still visible in the waters of Bounty Bay. Today, one of the island's most famous residents is its sole surviving Galapagos Giant Tortoise, named Turpen, who was introduced to Pitcairn sometime between 1937 and 1951. Several species of seabirds also nest here, including the flightless Henderson Crake, Fairy Terns, the Common Noddy, the Red-tailed Tropic Bird and the Pitcairn Island Warbler. Note: Pitcairn is a scenic cruising site. Ships will slowly travel past while a knowledgeable port lecturer points out significant sites you'll be able to see onboard. Considered the second largest island in French Polynesia, Raiatea is situated approximately 120 miles northwest of Tahiti. For the Polynesian "Maohi," ancestor of today's Tahitian, Raiatea was known as "Sacred Havai'i" and was the center of royalty, religion, culture and history. The principal village is Uturoa, with a population of over 10,000. This bustling port town features a colorful market and arts and crafts shops along the waterfront. Raiatea is currently undergoing a renaissance, with special attention being given to preserve the island's rich culture and heritage. Raiatea's importance as both a religious and historical center for all of Polynesia is complemented by a wealth of archaelogical sites, tropical scenery and reef fringed lagoons. The International Date Line is an imaginary line extending from the North Pole to the South Pole through the Pacific Ocean. It serves as the 180th meridian of longitude, and is used to designate the beginning of each calendar day. As you know, each adjacent time zone on the map has an hour time difference. However, at the International Date Line, +12 hours and -12 hours meet, bringing about a 24-hour time change. So while a person standing just to the west of the line may be celebrating Christmas Eve at 6 pm, someone just to the east will already be sitting down to Christmas dinner on December 25th. Therefore, when your ship crosses this line heading west, a day is added, and while crossing in an easterly direction, a day is subtracted. Crossing the International Date Line has long been a rite of passage for sailors, who often must participate in a line-crossing ceremony to become part of the sacred "Order of the Golden Dragon", an honorary naval fraternity.